Earlier various businesses revolved around native and web application. Indeed, these kinds of applications were considered as the most imperative channel for the businesses to connect with their respective audience. And, then came PhoneGap, Appcelerator and other frameworks that gave birth to the concept of hybrid application. Below are some key lessons I learned developing HTML5 Hybrid apps. Hope you find them useful. Bestowed with native features, Hybrid app is able to run offline. The users can use the previously loaded data and interact with the application without any hassle. The hybrid supports the content that is based on web architecture; thus, it loads slower than native app. In some circumstances, the varied components of hybrid application face technical glitches while loading on the mobile devices because every component is not compatible with every platform. Hybrid Interactive game apps like 2D or 3D still have a long way to go as these types cannot work same like native app. Being equipped with some challenges, there are the various brilliant ways for developing hybrid mobile applications effectively. Here, the blog presents the key do’s and don’ts tips that every hybrid developer should adopt. Let’s have a glimpse below to find more about tips; first start with a don’ts tips. Try to not use the heavy libraries such as jQuery. If it seems imperative for you to implement jQuery, then it will better to choose the lighter version that is Zepto.js. jQuery libraries harm the performance of mobile apps. Indeed, it slows down the usage of loading speed. It is good, if you make text in the app’s view get loaded sooner than the graphic as this will ease the way for the users to interact with the app. And at the same time, it boosts the performance. If it is possible, then do not use rich media content or heavy graphics because it slows down the application. It is not necessary that a hybrid application, which runs seamlessly on iOS will surely provide the same experience on Android or vice versa. It is required for the developer to make some adjustment in coding and format, so that it can run on every operating system perfectly. In order to deliver the native-like experience, it is better to use Ionic. It can be coupled well with AngularJS and ensures a better experience to the developers. AngularJS is a features-rich MVC framework that dose not leverage the libraries like jQuery. It is superbly designed framework that is suitable for hybrid apps development. It basically renders Backbone.js, which features a spectrum of lightweight libraries; for example, Thorax & Marionette. Optimize the graphics effects by reducing size of PNGs with the help of Tinypng.com. This will do not affect the quality and enhance the performance. Before delivering the hybrid application, test every aspect of application’s performance, load time and inconsistent view. There is a tool called Browser-perf that can help you check out the performance of the hybrid app on browser. Moreover, Relic, a third party service, can help you monitor issues related to response time, carrier performance, and many more. With the help of local storage, the hybrid application can easily deliver views excellently. Moreover, it reduces serer calls. As the speed is a big issue in hybrid apps, the local storage should be used to optimize performance and that improve the speed. Take the help of Chrome Canary tool to emulate the app for different devices. This will help you check the app’s view and performance on varied devices with different network setting. It is very necessary for you to be well-versed with the architecture and other aspects of framework. There are certain things that we mostly overlook. That leads to improper development of the application. 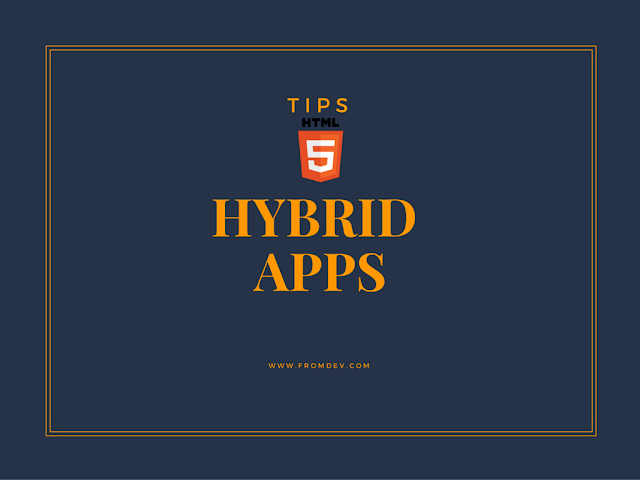 Hence, you should be aware of the potential and all the basic features of the framework that you will use for your hybrid app development. Undeniably, hybrid application development is viable solution for various businesses. But, in order to bring out native experience from hybrid app, there is long way to go. Many frameworks are in improving phase and in the future, it is believed that those days are not far that you have the capability to hybrid app that gives complete native like experience. Hope that these tips will help you sort out issues and enable you to build better hybrid applications.